The Prime Baja is a rear wheel drive 1/10th scale off-road electric desert buggy. With fully adjustable suspension, long travel oil filled shocks and amazing amounts of articulation, you get good ground clearance and the ability to drive over the most technical of courses with ease. Including a hi-torque 540 brushed motor, 1800mAh Ni-MH battery and charger, water-resistant ESC and servo, 2.4GHz transmitter and receiver all in one complete RTR package! A strong chassis is important for any off-road machine, and it's no different with the Prime Baja. With its high performance design, the Prime Baja takes all the latest refinements from its full size counterparts and combines them in a tough, ready to run package. The Prime Baja features a planet gear differential unit to ensure maximum strength and smooth, efficient drive transfer to the place you need it most, the rear wheels. The included transmitter is a state of the art 2.4GHz 2 channel 'pistol grip' system, which gives you the ultimate link between you and your car. There is minimal risk of interference, unlike older style FM radio sets. This means you can have up to 15 models racing at any given time without fear of signal interruption. 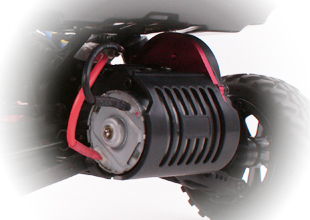 The transmitter features the ability to reverse servos, adjust end points for both throttle and steering settings, and gives you rate settings for your steering as well. There are also 2 bright LEDs to indicate the condition of the batteries in your transmitter. All of these functions are located under the hatch on top of the transmitter, where they can't be accidentally knocked or changed when transporting your model.